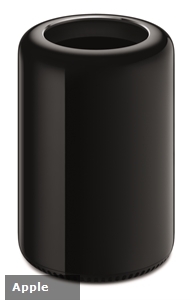 Revealed during the Worldwide Developer's Conference, the new cylinder designed Mac Pro has been on the wishlist of computer enthusiasts for nearly half a year. In several press events since then, the Mac Pro was only a footnote and a launch date was simply put as "later this year." Well the time has finally arrived and, on December 19, the new powerhouse computer will officially be available. According to a press release from Apple, orders will start online through the company's website, in the retail stores and at authorized resellers. This means it is possible for a user to walk into an Apple Store tomorrow morning and walk out with a Mac Pro. The device comes in two standard configurations. The baseline starts at $2,999 and features a 3.7GHz quad-core Intel Xeon E5 processor, two AMD FirePro D500 workstation GPUs with 2GB of dedicated RAM per unit, 12GB of system RAM and a 256GB flash storage module. The high end version comes in at $3,999 version and boosts the processor to a 3.5GHz six-core version, provides 3GB of dedicated RAM to each of those workstation GPUs, 16GB of memory and 256GB of flash storage. There are plenty of custom configurations that allow for 8- or 12-core processors, AMD FirePro D700 GPUs with 6GB of RAM, a maximum of 64GB of system memory and up to 1TB of flash storage. This computer is the powerhouse of the Apple computing family and many companies that need this level of performance are turning toward a Mac integration to obtain it.